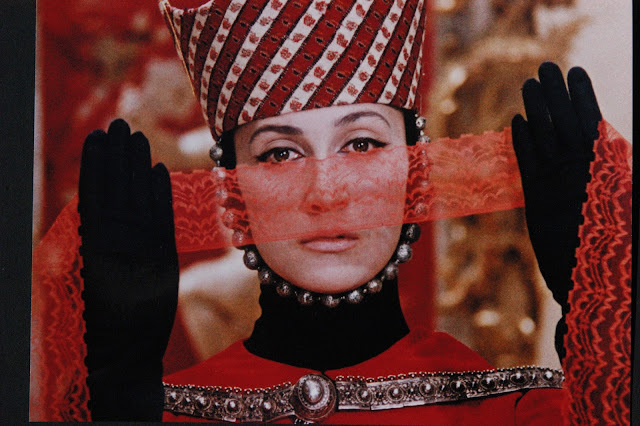 On the tails of the Met Gala and the opening of the Met Costume Institute's Heavenly Bodies exhibition, it seemed appropriate to start this series (Summer Movie Nights) with The Color of Pomegranates. The film, like the Costume Institute's new exhibition, occupies itself with the intersections of divinity, ritual, and human life. Intended as a biography of the Armenian poet Sayat-Nova, Sergei Parajanov's master work, The Color of Pomegranates, winds its exquisite way from childhood to death. 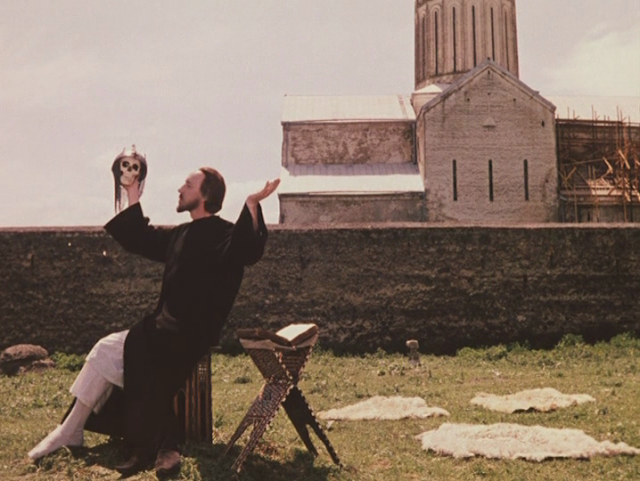 Though it gestures to the arc of a lifetime, the film is more accurately a collage of rich tabelaux and surreal depictions of Eastern Orthodox ritual touchstones that occur over the course of a person's life. 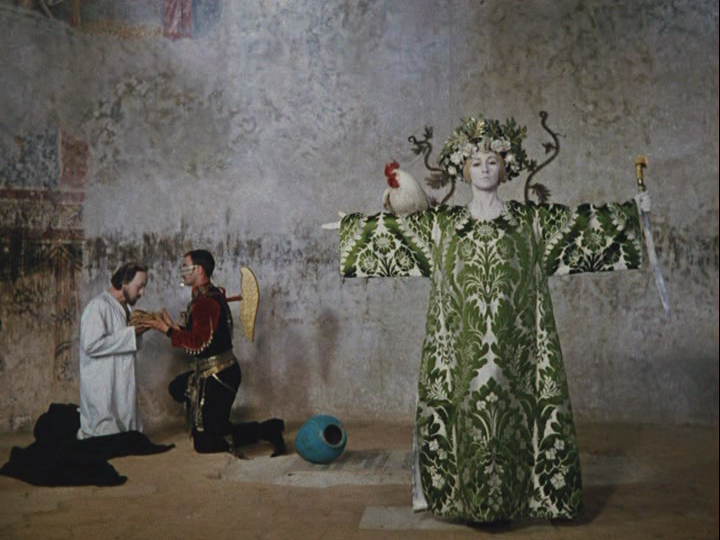 The Color of Pomegranates is permeated by a deeply moving, melancholic otherworldiness that emanates from the matter-of-fact performance of sacred rituals. 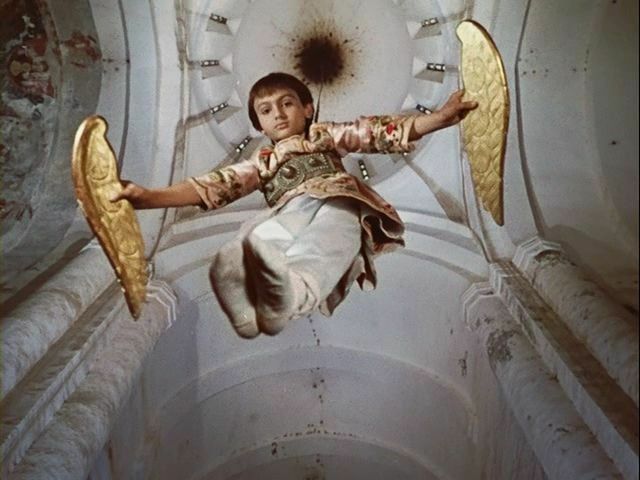 The fantasy of the film's costuming, its considered, painterly compositions and its focus on strange yet beguilingly familiar ritual performances of Eastern Orthodox Christianity create a vision of a world totally removed from our own. The Color of Pomegranates is a visual feast. Every actor's movement is slow and considered. In every frame, it appears as if an illuminated manuscript or perhaps a gilded biblical painting from the wall of an ancient cave church has been reanimated. Scene after scene captures highly charged moments of the human relation to and creation of divinity. Just beneath the surface of the film's loosely biographic narrative lies a broad-sweeping account of divinity and humanity. The film's depictions of the menial and the sacred illustrate the intrinsic link between man's knowledge of self and man's concept of God. The anointment of the quotidian, in which we see books, bread, and birds as religiously charged objects, is a gesture to man's capability to channel meaning through objects and actions. Man's ability to know himself and to derive significance from his interactions with the world he has built mirrors his ability to conceptualize and physically render divinity. Though it seems to hover above the human domain, the divine is innately human, as it was created by and for humanity. 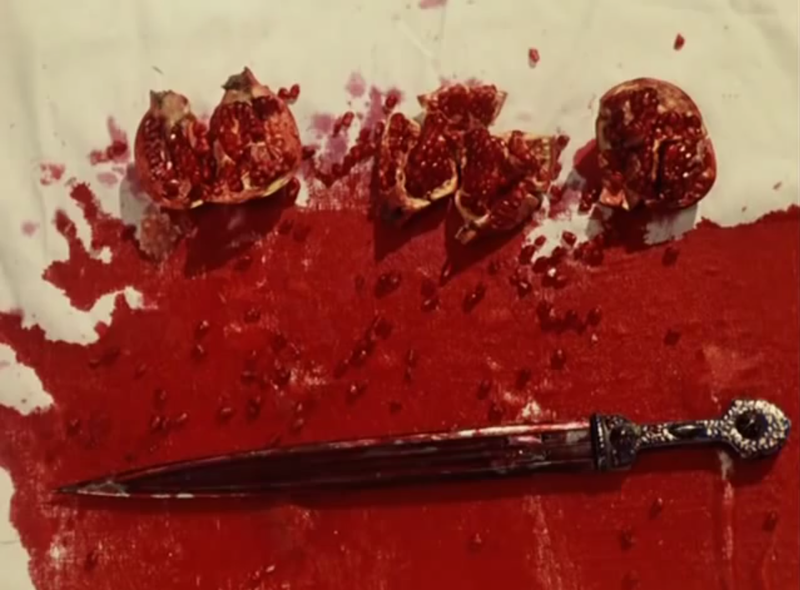 To watch The Color of Pomegranates online, click here. If you are a Bay Area local, don't miss the opportunity to see the film at the Pacific Film Archive on June 8th or June 9th, 2018. You can purchase tickets here.